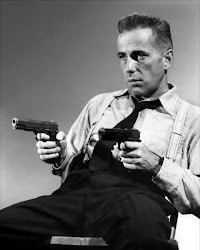 JOSE ZIALCITA NEPOMUCENO (1893-1959) a.k.a. Don Jose — Acknowledged as the Father of Philippine Movies, Jose Nepomuceno established Malayan Movies in 1917. He was the producer, director, cinematographer and scenario writer of the first 100 percent Filipino full-length movie, Dalagang Bukid, shown on Sept. 25, 1919 at the Empire Theater. 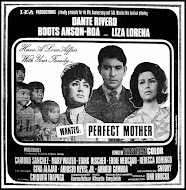 The movie was based on the zarzuela (the Spanish operetta or musical comedy) of the same title by dramatist Hermogenes Ilagan and Leon Ignacio; with the same cast, Atang de la Rama and Marcellano Ilagan (who later became a film director using the name Mar I.Esmeralda). 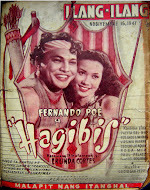 It was in his 1926 movie, Ang Tatlong Hambog, that the first screen kiss was featured (by vaudeville actress Elizabeth "Dimples" Cooper and sportsman Luis Tuason). 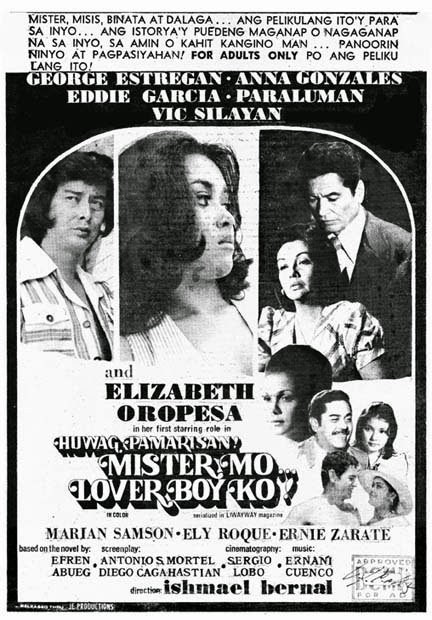 Nepomuceno trained young directors like Gregorio Fernandez (the father of Merle and Rudy Fernandez), shared his skills with other budding producers like Vicente Salumbides and Julian Manansala, discovered and honed the talents of early major stars like De la Rama, Fernando Poe Sr., Mary Walter, Leopoldo Salcedo, Rogelio de la Rosa, Carlos Padilla, Naty Bernardo (introduced in Punyal na Ginto, 1933) Maria Elsa Oria (introduced in Awit ng mga Ulila, 1936, with Tita Duran and Angelito Nepomuceno as the orphans) and Patrocinio Abad (whom he christened Corazon Noble in Anak ng Pari, 1937). 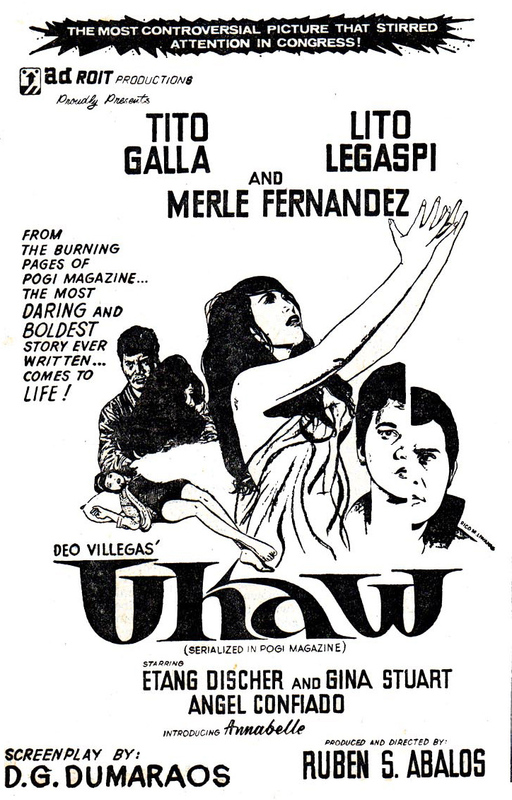 Due to budgetary constraints, Nepomuceno served as producer, director, story and script writer, camera and laboratory man, art consultant, editor, distributor and exhibitor of his own pictures. 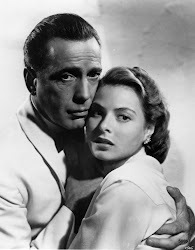 Great setbacks and personal adversities like the fires which gutted his house and studio in 1921 and 1923 did not deter him from pursuing his dreams and career. During those times, his wife, Isabel Acuna, stood by his side serving as talent scout, casting director, costume supervisor and make-up artist, and eight children (Jose Jr., Isabel, Antonio, Lubin, Victor, Angel, Luis and Carlos) ready to volunteer their services. 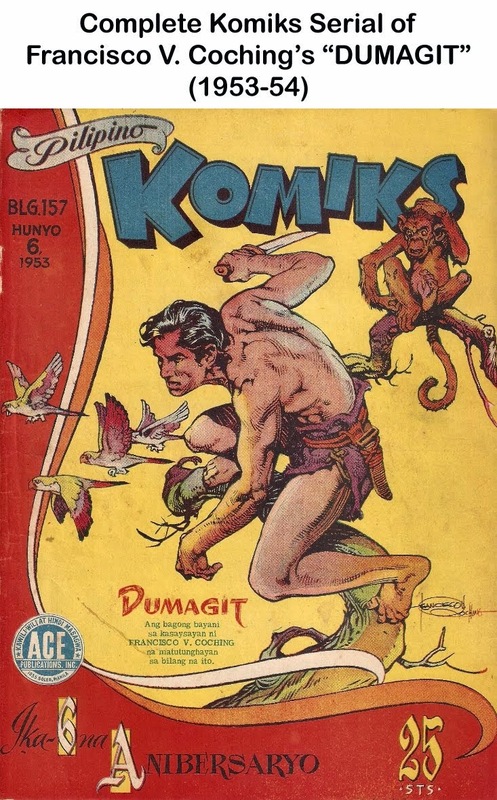 Nepomuceno died of a stroke in 1959 at the age of 66. 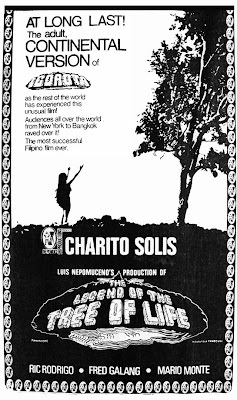 In 1967, his son, Luis formed Nepomuceno Productions with its initial movie venture, Dahil sa Isang Bulaklak. 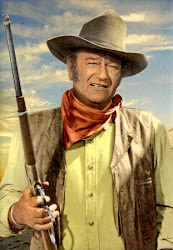 It became an instant hit and a box-office drawer during its theater run. 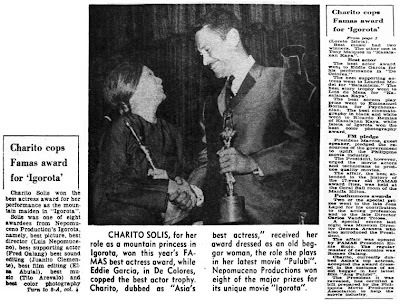 Charito Solis, the lead star won the Best Actress award at the 1967 Asian Film Festival. 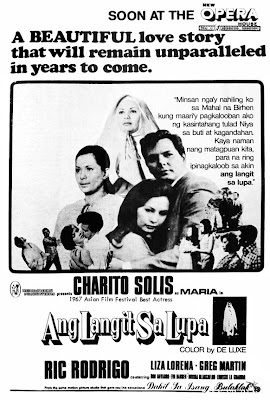 The movie also figured prominently in that year's Famas awards being nominated in all major categories. 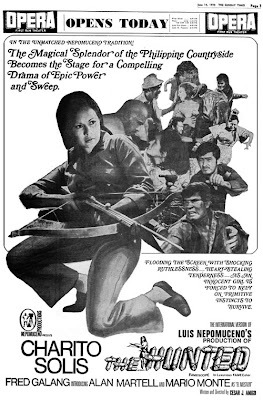 The following year, 1968 was the banner year for Nepomuceno Productions. 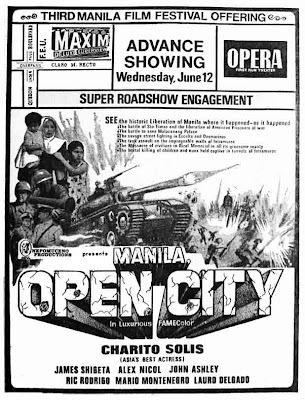 They came up with three good quality movies that year- Luha sa Karimlan, Manila: Open City and the award-winning masterpiece Igorota. 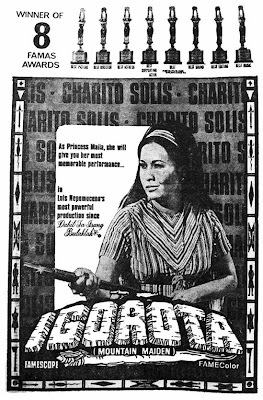 Igorota ran away with eight major awards in that year’s Famas awards--- Best Picture, Best Actress (Charito Solis), Best Director (Luis Nepomuceno), Best Supporting Actor (Fred Galang), Best Sound Editing, Best Film Editing, Best Music and Best Color Photography. 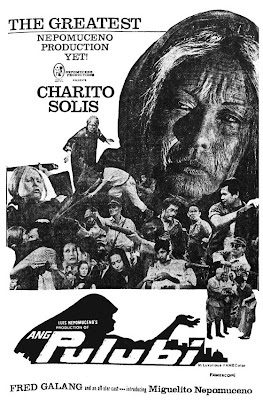 From 1967 to 1971, Nepomuceno Productions produced 8 movies, considered as masterpieces, all with contract star Charito Solis--- Dahil Sa Isang Bulaklak, Ang Langit Sa Lupa, Luha Sa Karimlan, Manila Open City, Igorota, Ang Pulubi, Pipo and The Hunted. 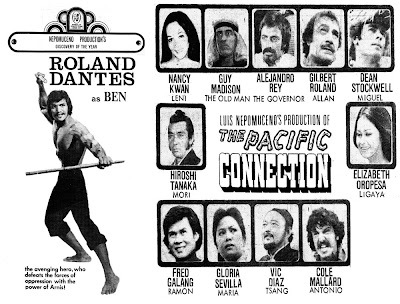 Their last production, The Pacific Connection in 1974, was a major setback. The capital which they used to produce the movie was loaned from the Philippine National Bank with their property at Malugay Street, Makati as collateral. The loan amount originally at 4 million pesos went up to 7.5 million pesos. 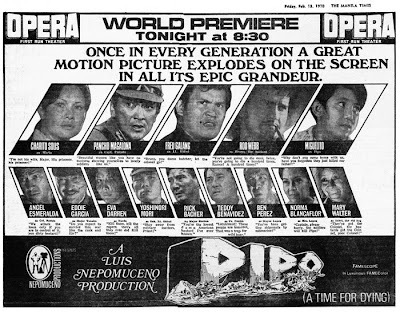 Nepomuceno Productions never recovered from that and eventually folded up. The case was later filed before the court (see PNB vs Nepomuceno Productions). Greetings! I am a writer/ columnist for the Philippine Times community newspaper here in Melbourne, Australia. 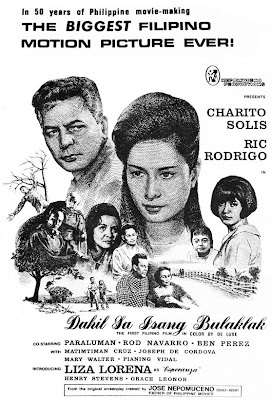 I wish to request your kind permission for me to use the poster of “Dahil Sa Isang Bulaklak”, “Igorota” and “The Legend of the Tree of Life” for a series of articles I am featuring entitled “In Retrospect” – “Whatever happened to our outstanding Filipino classic masterpieces?”, which upon due approval by our editor/publisher, should be slated for publication sometime Sept.-Oct. 2008. I would, of course, acknowledge your name and website to give credit to the source of these posters. May this merit your kind written consent/ approval with your response to this request. Congratulations on your terrific website – a national treasure-chest of veritable information about practically everything our media and entertainment industry can be so proud about. A website loaded with inspirational resource materials – a database like no other I’ve come across - what a monumental achievement! I highly commend and salute your years of research and efforts of putting together such rare collection of memorabilia, and your incredible dedication to this pursuit. What a great website worth spending hours exploring the wealth of our nation’s formidable personalities and rich heritage… may the force always be with you Simon! congratulations to your blog . 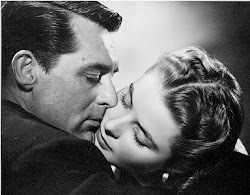 i wish to request your permission to use some pictures for my powerpoint presentation re old movies. 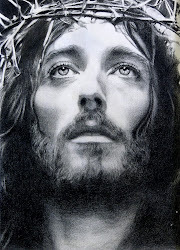 i will properly acknowledge your website .hoping that his will merit your kind approval . 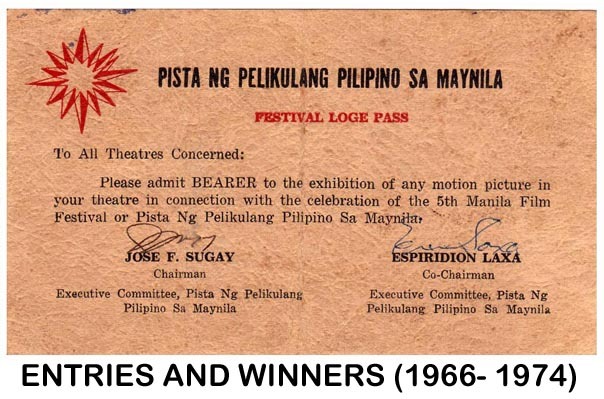 thank you very much sir and more power to your wonderful website and more power to you for creating this veritable virtual museum of philippine cinema. I like Fernando Poe Jr he is my idol he played as hero/protagonist & savior & protector of the innocents in Filipno films & media. Thanks!